Feedback is one of the most powerful influences on learning and achievement. But research has also shown that this impact can be either positive or negative. Although feedback is among the major influences, the type of feedback and the way it is given can be differentially effective. John Hattie discusses this fact extensively in his book “Visible Learning for Teachers (2012)” and Helen Timperley contributes the “Feedback” chapter to the compendium “International Guide To Student Achievement (2013)” by Hattie and Anderman. 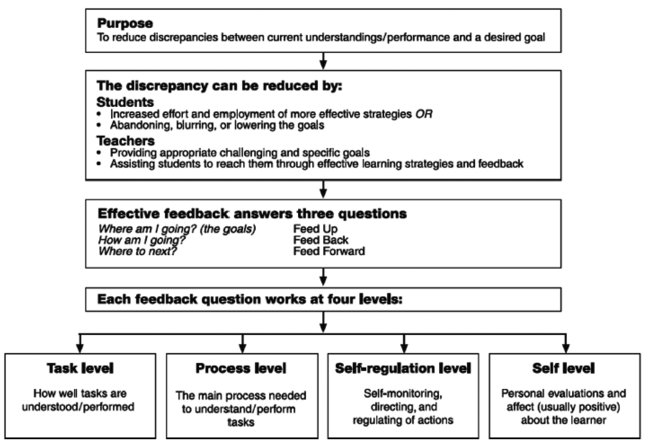 In an often cited article from 2007 Hattie and Timperley provide a conceptual analysis of feedback and analyse the evidence related to its impact on learning and student achievement. They develop a model of effective feedback that identifies the particular properties and circumstances that make it work. Hattie and Timperley demonstrate how feedback can be used to enhance teachers effectiveness in the classroom and student achievement. The Power of Feedback by John Hattie and Helen Timperley appeared first in the Review of Educational Research; Mar 2007; 77, 1. Growthmindseteaz.org provides a PDF to download this article. 11 other websites write about for "John Hattie & Helen Timperley: Visible Learning and Feedback"